Joel Taylor explains the whole thing pretty well in "Tornado Glory." "This is the one thing I do that is crazy," says the twentysomething graduate of the University of Oklahoma School of Meteorology. "Some people skydive. Others climb mountains. I chase tornadoes." He and his chasing partner Reed Timmer do just that. A lot. And first-time filmmaker Kenneth Cole puts viewers right alongside these fearless stormchasers in his one-hour documentary "Tornado Glory," airing this week on KOED, and coming in August to the PBS national network. "Tornado Glory" is essentially a "buddy" film enhanced with incredible storm footage shot during May and June of 2003, explained Cole in a recent phone interview. "I had two reasons for making the film," said the 27-year-old, who has a degree in meteorology and a master's degree in mass comunications from OU. "One, I wanted to convey what it was actually like to watch storm chasing, to put the audience in the passenger seat and look at it from a perspective not seen before," Cole said. ""The second reason was to let viewers get to know the people who do this. You have memories of the tornadoes you see but also of the long hours you spend on the road and the people you chase with." It's about sharing a passion -- perhaps even a mania -- for weather. In 2003, when the film was being shot, Taylor had just graduated and Timmer was in graduate school. Cole, who had storm chased as a student but had never seen a tornado, knew about the powerful storms from his classes at OU. Both Taylor and Timmer were eager to sign on to the project, he said. Taylor is the quiet one. He is a farm boy from Elk City in west central Oklahoma who pointed out his first tornado at age 4 before the warning sirens had gone off. Timmer is the complete opposite. He's a loud, outgoing guy from Ada, Mich., a suburb of Grand Rapids, who collected bugs and predicted snow storms that didn't always materialize. Both wanted to study weather -- not just the science of it but to chase tornadoes. Timmer is the most determined. He's been known to drive 50,000 miles during a storm season, from Montana to the Mexico border and push dangerously close to a giant twister. Taylor is more laid-back. He's the driver who sacrificed his vehicle to giant hailstones, driving rain and, on occasion, flying debris. In the film, the team spends hours on the road together. Sometimes nothing happens. They might be in Kansas tracking a storm that never generates a funnel while the tornado sirens are going off back in Elk City. On another occasion, two tornadoes form right in front of them. It's all in the storm-chasing game. "I had chased storms for years . . . and had never seen (a tornado) until April 5, 2003," said Cole, whose productuion company, Angry Sky Entertainment, is based in Oklahoma City. "(That first tornado) is actually in the movie, and I just wanted to scream in excitement. But I couldn't because I was filming." That adrenalin rush is evident in film of the storm chasers. Timmer and Taylor are shown shouting in excitement only moments before they fret about the safety of those in the path of the storm. "I love chasing storms, just the structure of the storms, watching tornadoes," says Taylor in the film. "There's nothing like getting within a quarter of a mile of a tornado." For Timmer, it's a way of pushing the envelope, seeing how close he can get to without being hit by a twister. Timmer's daring leads to more than one argument between the two chasers: Should they go forward or stay where they are? Get closer or back up? Stop for gas and risk missing a great tornado shot? Cole knew shooting the film was a risky business. "It was very intense in a good way," said the Boston native, who continued attending college classes during the day and chased storms in the afternoons and evenings. "I had to be on call at any moment for any kind of storm." Cole, who wrote, directed and produced the film, went on 13 chases with Timmer and Taylor in 2003. Four of those resulted in sightings of at least one tornado. The difficulty in making a film about storm chasing is being there when Mother Nature lets loose. "The biggest challenge was not knowing what's going to happen," he said. "As a filmmaker, you start out with certain questions you want to answer. You don't know if you will see tornadoes and what kind of stories will unfold. You have to put yourself in position to document the unexpected." The film, which also contains original music composed, performed and recorded by OU students, was first presented at film festivals before being submitted to OETA and, in turn, Public Television. Within 13 hours of receiving the film, PBS decided to pick it up for national airings, starting Aug. 1. It is, Cole was told, the first Oklahoma-made film to be broadcast nationally on PBS. "Tornado Glory" also contains interviews with other students and professors, even those who don't agree with the risk-taking of Taylor, now working in real estate, and Timmer, who is studying for his exams for his meteorology doctorate. That risk-taking is the key to Timmer, said Cole. 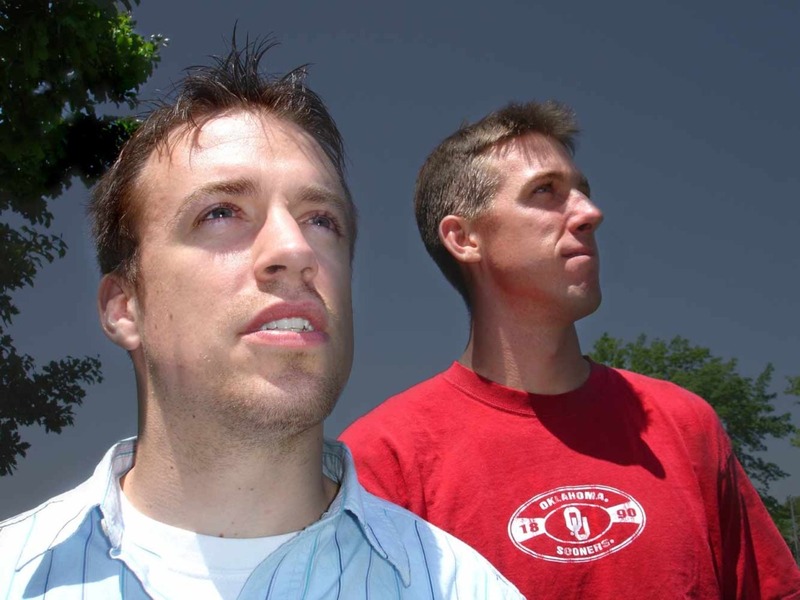 "Just that makes Reed (Timmer) that much more interesting of a figure. Reed captures how everyone feels. Deep down, everyone who loves storms would love to do what Reed does and get as close as possible and feel that adrenalin rush . . . He is definitely extremely intelligent. He knows these storms, but he also takes these risks that not many people will take." For Cole, getting the footage for his film by traveling with Taylor and Timmer meant "being smart in terms of meteorological skills, being quiet, saying a few prayers and trusting them."